She’s planning us a family trip to Spain for new years and is trying to book train tickets from Madrid to Barcelona. You’d expect this would be easy enough: go to the website, enter your origin and destination stations, choose your time and pay with a credit card. However mum said the site keeps spitting back an error after taking credit card details. She sent me the details: www.renfe.es (don’t miss the www or it doesn’t work). So I thought I’d give it a go. The website purports to be multilingual, but only navigating the Spanish version gives you all the special prices. A few Google translate steps later I’ve chosen my tickets. At this point I have no idea if they’ve taken my money or not, whether I should try again, wait a minute, an hour, a day? A check of my online banking doesn’t show any money having been taken. So I try again. Nope, second time and the same error. So I leave it a day. We really need to book these tickets before the prices go up, so I search the site for something resembling a contact form. All I can find is this ridiculous, condescending “virtual assistant” who is totally unhelpful. enter my credit card number I get an error from your site. My friend has also tried to book and every time she gets an error too. at 10:30am on AVE 03103. Regarding your email we inform that Windows 2000 o XP is recommended as well as Internet Explorer in order to purchase successfully through our web site. Any other browser or operative system may cause problems in data downloading properly. Java has to be active, unblocked cookies, old temporary files must be removed. 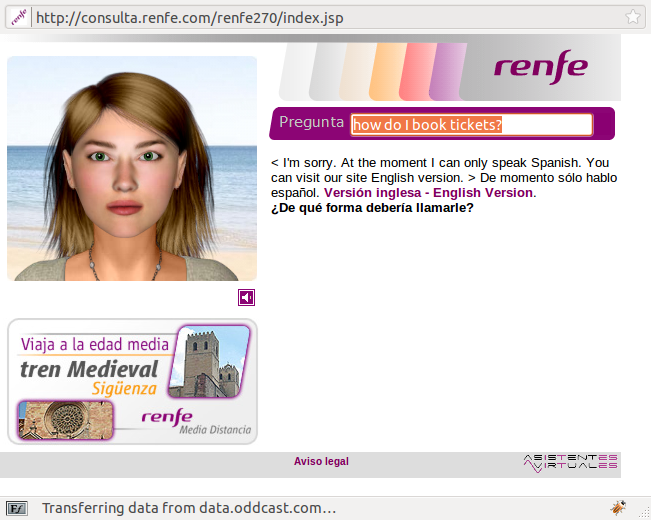 You have to enter directly to www.renfe.com , no through Google or another search page. Please note Google must be avoid as it also may cause security problems. So in general, we suggest to avoid anything that could interfere in our system security protocol. 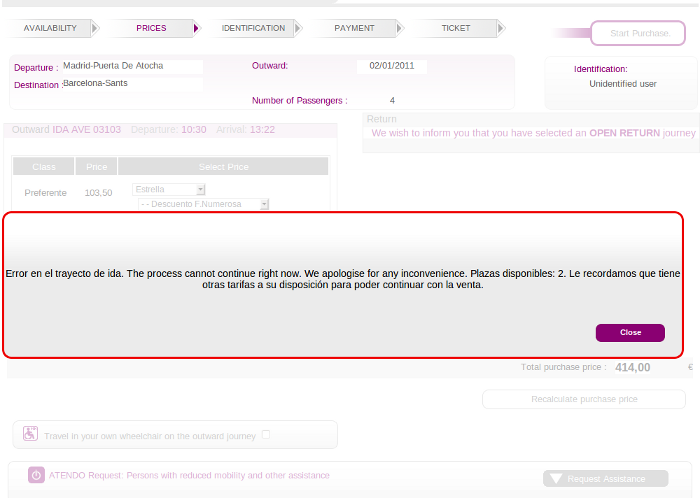 We are having some troubles with some foreign credit and debit cards payments on www.renfe.com where normally you can make purchases. We apologize, but there is an error produced when Renfe´s server try to connect with some of the overseas Bank´s servers. If you have a Spanish credit card or an American express you can buy tickets calling to +34 902 320 320 telephone number. We are so sorry for the inconveniences, and we are working to solve it. Wow! I have to be using a 9 year old operating system to access your website?!? If I access your website via Google it causes security problems?!? A quick look at the headers shows that the site is running IBM Websphere, which is an “enterprise grade” web server, meaning it probably took several years to develop and cost hundreds of thousands of euros. It’s a site I would be ashamed to deliver to any client of mine; it’s ugly, buggy, unintuitive and doesn’t serve the simple purpose of selling train tickets. Why do software buyers tolerate such poor quality? And why do they pay so much for it? Here’s a simple test to test whether your web developers are delivering: what’s the one thing people are coming to your site for and does your site fulfill that? Because everything else is secondary, all the pretty virtual assistants in the world are not going to help.